Have you given much thought to curtain poles in Manchester? It’s likely that your attention has been focused on the curtain fabric, style and how they coordinate with the rest of the room. Of course, all of that is very important as you design your room. We offer a stunning selection of fine quality fabrics in all styles and our curtain makers are top rated. As interior decorators, we focus on every detail of the room. Sometimes the charm is in the smallest detail and you don’t know the impact until you see it for yourself. Curtain poles are one of those details that, if you get it wrong, can rob a room of its potential to dazzle. You could go to a drapery shop or hardware store and find metal or metal looking type of curtain poles. 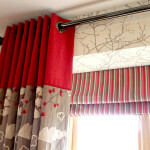 They’re usually quite inexpensive and do the job in Manchester curtain poles are made for without drawing much notice. If they don’t draw much notice then neither do they add to the overall completeness of the room. At Milan Interiors we think everything counts. We offer beautifully and expertly designed curtain poles, painted in the colour blend of your choice. The paint is not going to chip or peel over the years so your curtain pole, and your choice of finials will stay looking beautiful for a long time. People will notice how the poles compliment the entire window dressing. Millan Interiors, with our many years of experience, encourage you to view our curtain poles in Manchester. Contact us and let us show you how they coordinate with some of our beautiful fabrics to create a finished designer look. We’re here to help you select colour combinations, fabrics and carpets for your home or office interior. We’ll help you a little or organise the whole project for you. Or, we can help you with finishing touches that complete and the little details that give your living space a designer touch. Please, come visit our shop. Here you will find everything to freshen your decor and professional advice to bring it all together. You might also find that one perfect lamp, table or decorative piece that is the final touch.